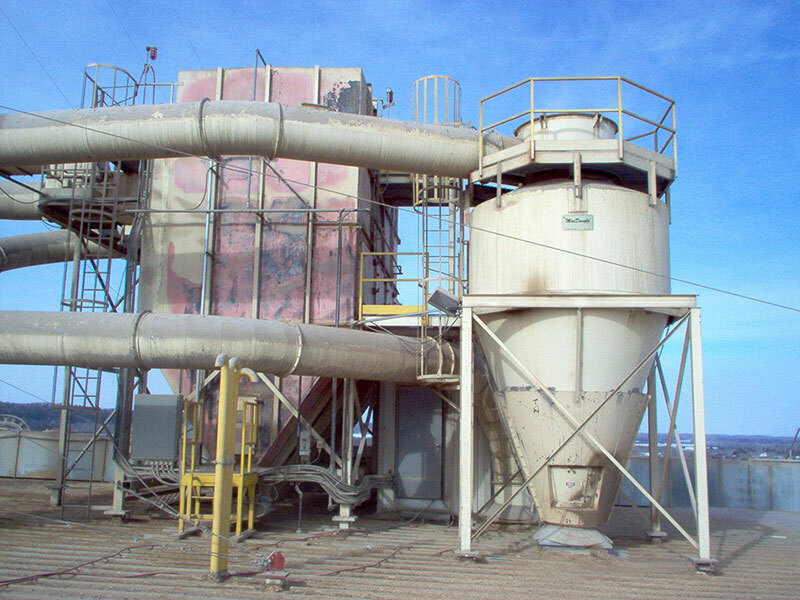 Did you know that in 1971 a change to the design of Dust Collectors resulted in low filter ratio selections, higher costs, more maintenance and increased problems? See how our design prevents that! New Advanced Technology eliminates design flaws; allows for High Ratio (filter ratio) Operation. Before getting into Filter-Ratio discussion, the History of Reverse Jet and Pulse Jet Design and Development must be reviewed to determine proper selection of collectors. The first pulse jet collector was developed by Pulverizing Machinery of Summit New Jersey in the early 60’s, to collect dust from their Pulverizers. They had tried to use the Blow-ring design but they could not handle the dust (powder ) loads as their grinder Pulverizers became bigger. The typical load to the collectors from the Pulverizers were between 150 and 300 grains per cubic foot. The collector design was based on the same blow-ring filtering velocities at these loads. The cages were based on available designs from shipping pulverizer shafts. The pulse valves selected were diaphragm valves that were the fastest and the lowest cost valve available. This valve happened to be a ¾ inch diaphragm pilot operated valve. They decided to use several valves in a collector and pulse them with an electronic timer. It was found the hole sizes and venturi formed an air ejector design that had the same jet velocity that the blow-ring collector was using. But the big breakthrough came with the realization that the dust was ejected from the bag during the first 4 or 5 milliseconds of the valve opening. The valves were operated as fast as the mechanical design allowed. The operation was completed in less than 0.10 seconds. It became apparent that the frequency of cleaning was a function of the load to the collector. For instance for loadings of 300 grains the collectors would operate at a filtering velocity of between 7 and 9 ft per minute. At material handling facilities such as quarries, the collector would run at velocities of 14 to 16 feet per minute. The typical pressure drop in these collector designs were about 3.5 inches water gauge pressure for the high loads and 2.0 for the lower dust loads. The typical compressed air usage on the high loads were 1 to 2 SCFM per 1000 CFM of filtered air. For loads under 10 grains per cubic foot, the air usage was 0.2 to 0.8 SCFM per 1000 CFM of filtered air. Determining the filter velocity (then referred to as filter ratio) became a rather complicated procedure. The ratio presumably was determined by dust load, fineness of the dust, temperature of process gas stream, and other factors. The hopper inlet was a carry over design from both the blow-ring collector and the previous mechanical shaker collectors. By 1969, there were over 10,000 collectors in operation, almost all were installed on process exhaust from Pulverizers or in foundries. Pulverzing Machinery changed their name to Mikropul and licensed FlexKleen to also build and Market collectors. The collectors for MikroPul had 4 ½ inch diameter bags 72 inch long and the FlexKleen units had 5 inch bags 102 inches long. Bag life was 3-5 years on Pulverizer applications and over eight years on low loading applications. In 1971, the patent was challenged and the Pulverizing Machinery patent was declared invalid. The market changed radically because Air Pollution Control Regulations also became effective at the same time. Many new suppliers entered the market. In order to compete, Mikropul changed their design. They went from 6 foot to 10 foot bags. They increased their pulse pipe holes by the same ratio. The whole industry followed and copied the new design for hole size and venturi throat diameter. At the time, Mikropul had 40,000 venturies in stock and kept the same venturi sizes. This increased the jet velocity of the cleaning jet by 66 per cent. (1) pressure drop increased to 4 ½ to 6 ½ inches w.c..
(2) Compressed air consumption increased by over 50% for similar applications. (3) Reduced bag life by over 50%. (4) In reaction to these problems the filter ratios were reduced to between 4 & 6 on almost all applications. No one at that time realized what might have been a rather obvious truth, that the velocity with which the dust is ejected from the bag during cleaning is proportional to the velocity of the cleaning jet. At the new velocities, dust is driven toward adjacent rows of bags in the filter mode. Depending on the dust density, the dust will be driven through the adjoining cake into the clean side of the bags. The cake becomes more dense and the pressure drop increases until the process stabilizes which takes 16-100 hours. Even after the equilibrium, the dust still penetrates and bag wear is high. With low filter ratios it takes longer for the bag to wear out and require longer times between replacements. Most of the pulse jet collector suppliers in the world today still employ this disastrous design. A new technology was developed twenty-four years ago, a new pulse jet collector that basically changed the cleaning system design. The key to this design was to change the jet velocity to a fraction of the existing designs. New Technology eliminated the penetration of dusts from the row of cleaning bags to the adjoining row in a filtering mode. (5) decrease dust penetration by up to 90%. There have been several suppliers building and selling these New Technology collectors since 1982. In fact the patents have now expired. There are over 4000 installations worldwide. WHY IS THIS NEW TECHNOLOGY NOT ACCEPTED BY ALL THE MAJOR SUPPLIERS? 1) If you produced 40,000 collectors after the development of the new technology was published over 20 years ago, you might be subject to legal action for poor judgment and causing the public to be overcharged for their dust collection. 2) They do not have the engineering expertise to build these new technology collectors. 3) People using the old obsolete technology control over 90% of the market world-wide. 4) The suppliers of valves and filter elements would have their markets cut in half. MODIFYING EXISTING COLLECTORS WITH ALMOST NO RISK TO THE PURCHASER. We can supply new bags, pulse pipes and bag plugs to alter performance to high technology low pressure drop, reduced air consumption, lower penetration (immediately noticeable) and long bag life (it takes some time to verify that but it should be obvious from the other indications). The modifications take only a few hours and if a customer is not satisfied, he can return pipes and cages for credit and re-install the old components. If this was not an absolute certainty customers would not pay for the equipment.